/ The project Delsan-A.I.M. is currently decommissioning and demolishing the Nanticoke Generating Station under contract with Ontario Power Generation. In undertaking all our contracts, but more specifically with this large scale, multi-year project, the safety of the workers and the public, as well as the protection of the environment are our primary concerns. All the work on site, therefore, is being carefully planned and engineered. This former coal-fired thermal electric generating station, once the largest in North America, is located along the north shoreline of Lake Erie near the Town of Nanticoke in Haldimand County, Ontario. It consists of eight (8) generating units that had a full capacity output of 4000 MW, which were constructed in phases between 1967 and 1978, and decommissioned in 2013. The powerhouse is the main building on site where the electrical generating equipment is housed along with the associated boilers, coal handling equipment, pulverizers, turbines and generators. On the south side of this building, there are large steel framed structures that support the precipitators and ductwork, which connected to two (2) – 650 foot reinforced concrete chimneys. / A team of specialists Delsan-A.I.M. has teamed up with specialists in both structural and environmental engineering to ensure the successful and safe completion of this project in accordance with all governing laws and regulations. / Safety first Before any demolition work can even begin, the buildings and structures have to be made safe. This is accomplished by ensuring that all services, such as electricity, have been disconnected and that all hazardous materials have been removed and properly disposed of. Confirmation of the completed work is being performed by environmental engineering consultants who undertake a final inspection. There are existing live infrastructures on the project site that must not be damaged such as live switchyards and high voltage power lines that serve the Ontario electrical power grid, as well as a solar panel farm, which is presently being constructed nearby. In addition, the water intake for the Haldimand County Water Treatment Plant is located adjacent to the project site along the shoreline of Lake Erie. Delsan-A.I.M. has implemented various measures to protect these infrastructures from the potential effects of the demolition work. The water intake channel, for instance, has been isolated from site activities and entirely protected using a specially designed floating cover. In light of the new construction planned for the site, Ontario Power Generation required the demolition of the two chimneys early on in the project schedule. The safest and most efficient way to undertake this kind of demolition involves the use of explosives to cause the structures to fall in a carefully controlled manner. Delsan-A.I.M. prepared a blast plan in order to ensure the safe demolition of the chimneys and the protection of the public and nearby infrastructures. The planning included detailed structural engineering using cutting-edge software to ensure not only the integrity of the chimneys during the preparation phase but also the controlled failure and drop direction. The control-drop involved making a mouth opening at the base of each chimney in-line with the direction of the fall. Part of the mouth was made ahead of time, while the remainder was loaded with explosives. When all the preparation work had been completed, the explosives were remotely detonated, which resulted in the safe demolition of the chimneys and the completion of this important milestone. / LARGE SCALE PROJECTS Mirabel Airport decommissioning, CN tunnel dismantlement, Ritz-Carlton development project, General Motors plant decommissioning, and many more. 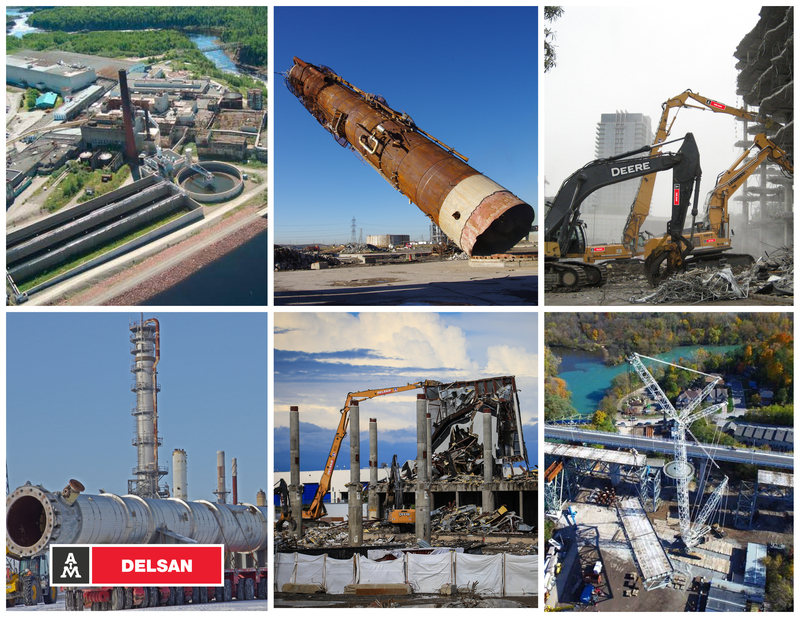 / SAFETY FIRST At Delsan AIM, our employees are all well versed in demolition, decommissioning and are all trained to provide the highest level of safety at our jobsites. / LEADING TECHNOLOGY These strengths combined with our own state-of-the-art equipment fleet and use of leading-edge technology is what guarantees success... on time, every time!